Whenever I admire Valentino’s latest collection fresh off the catwalk or the black and white photographs of chic, Parisian women adorned in Mr Garavani’s creations, I always feel that the entire look embodies everything that I am. Valentino has and always will be my greatest love. Every season I gaze attentively at my computer screen, watching the glittering beading, delicate lace and shocking reds glide down the catwalk. I ‘ooo’ and ‘ahhh’ every 30 seconds and whilst I know I cannot buy the dresses I always finish the collection glowing with happiness, passion, appreciation and determination. Valentino reminds me of why I love fashion, why it’s a stunning art that takes a certain eye and attention to detail to create. Chic fashion gives me a warm glow that I cannot get from anything else. It’s a yearning so beautiful that it doesn’t need to be satisfied. I am as in love with Valentino now as I would be if I had a wardrobe filled with nothing but. To me, Valentino is the epitome of chic, class and elegance. It is perfection in its most fashionable form. Having spent just a year and a half living in London I have already felt spoilt with the choice of exhibitions, London fashion week and the ever-flowing river of style and imagination that dwells within this fabulous city. 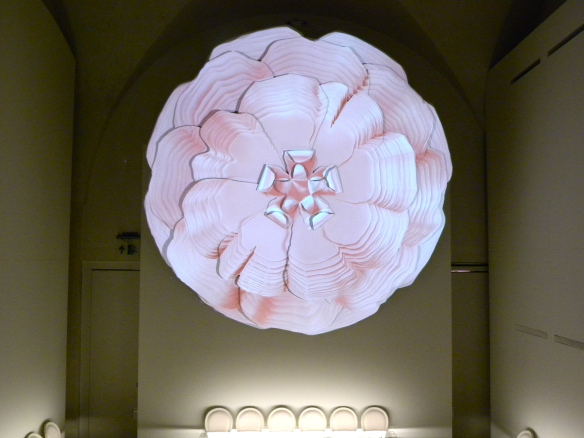 It was a dream come to true to discover my favourite design house would be exhibiting as well! And where else but the home of London Fashion Week; Somerset House. I made my way to the entrance during a rather chilly day and was instantly warmed up by the extravagant, oversized white rose that stood before the ticket desk. As I proceeded into the first room the same emblem appeared once more, this time projected with beautiful floral patterns, sunsets and blushing pink hues. The five metre three sculpture was memorably breath-taking and reminiscent of the dresses that lay ahead. Surrounding the room were tables filled with precious archives, balancing delicately on French, balloon-back salon chairs in chic, cream shades. 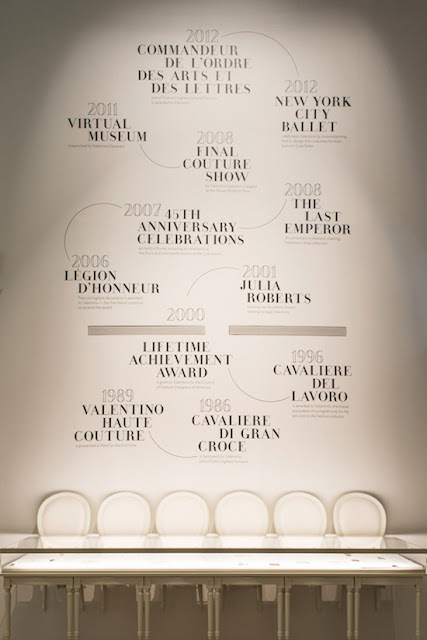 Overhead the walls were emblazoned with dates and timelines of Valentinos most eminent moments. 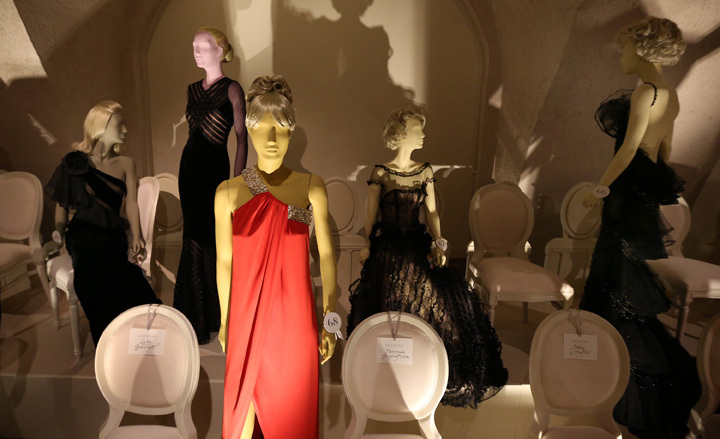 Displayed in the first vitrine were several invitations going back to Valentinos earliest shows and even an original seating plan. I couldn’t help but admire the romantic typography and distinct parchments, as well as imagining receiving one of these invitations myself – that would be a dream come true! I move onto the next display that holds several personal letters to Valentino. The affectionate accolades reveal the high level of respect the fashion industry, princesses and celebrities have for the designer with many hand written and signed with kisses. His admirers include Donatella Versace, Anna Wintour, Princess Ira Von Furnstenburg, Diana Vreeland, Karl Lagerfeld, Jacqueline Kennedy Onassis and Meryl Streep. One of my favourite letters was from Manolo Blahnik written to Valentino in 2008. It was charmingly affectionate and Manolo’s handwriting is the most fanciful and poetic I’ve ever seen. 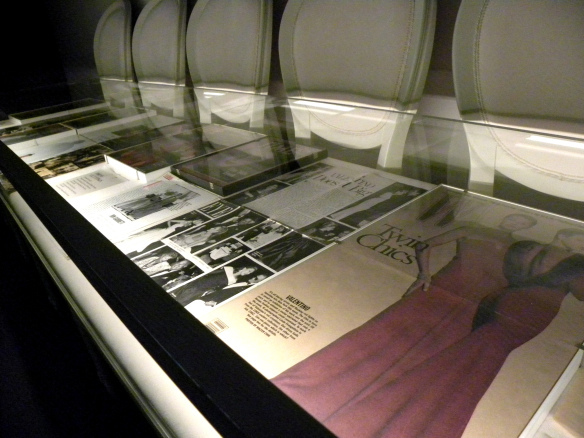 The next display featured a personal collection of photographs, whilst another held magazine covers and articles featuring the designer’s garments. 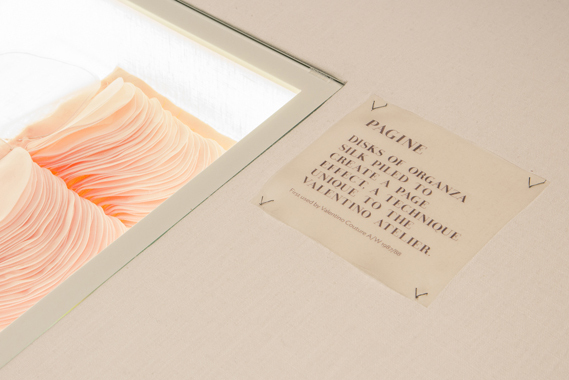 The final case housed hand-drawn sketches that showed detailed gowns and suits, immortalising Valentinos raw imagination. 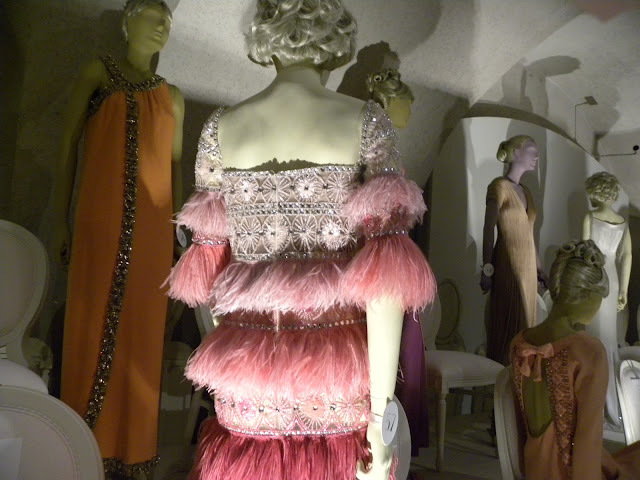 The exhibition continued up stairs where I found myself taking in a gracefully lit tunnel filled with 130 haute couture pieces from the past five decades. If there is a heaven for me, this would be the walkway to it. 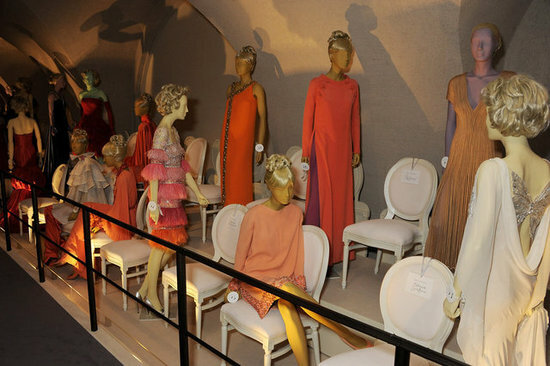 The tunnel is laid out like a fashion show, with rows upon rows of classic French chairs and mannequins poised in elegant postures. I couldn’t help but feel a sense of irony that I, along with the other visitors had to flounce down the elevated runway in the presence of an audience of couture. 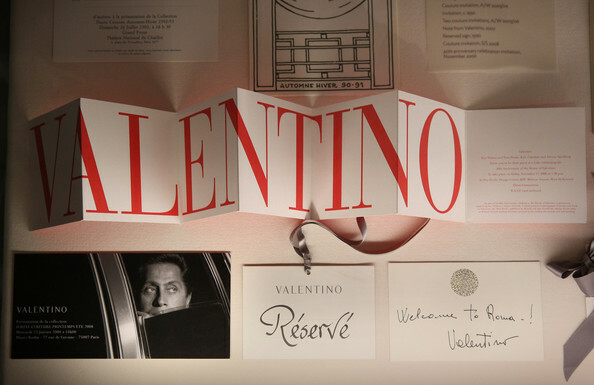 The unoccupied chairs were labelled with hand written place cards depicting glamorous names of Valentino’s most notable clientele. Fastened to the chairs with lilac silk ribbon the cards addressed the patrons with ‘Mademoiselle’ followed by names such as ‘Audrey Hepburn’, ‘Sophia Loren’ and ‘Grace Kelly’. The romantic décor and dreamy ambience made me feel as though I was at an elegant gala in Paris, and judging from the captivated expressions and hushed whispers of other visitors it was a mesmerising sight for everyone. As explained in the exhibition brochure the mannequins are coloured by the era of the garment they are wearing. The difference was subtle and the delicate shades of each colour did not detract from the splendour of the dresses. The brochure was also the source of information for the couture pieces since the mannequins only identification was from numbered circles attached to their wrists. 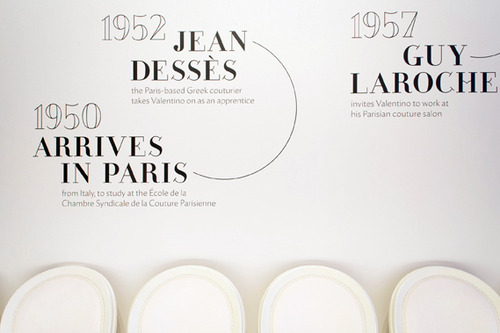 Each number was then explained in the brochure, providing the date and description of the garment. As someone who desperately tries to absorb every word written in an exhibition this allowed me to free my hands for writing just my own opinions. The numbered circles around the wrists were custom during couture shows in the early twentieth century in Paris and London. I could easily envision the earliest dresses gliding into a pulchritude room filled with affluent clients, silver screen actresses and bustling photographers. As expected I fell in love (big, puppy-dog eyes love) with most of the dresses on display, except a few flamboyant designs from the 70’s and 80s that were not to my taste. 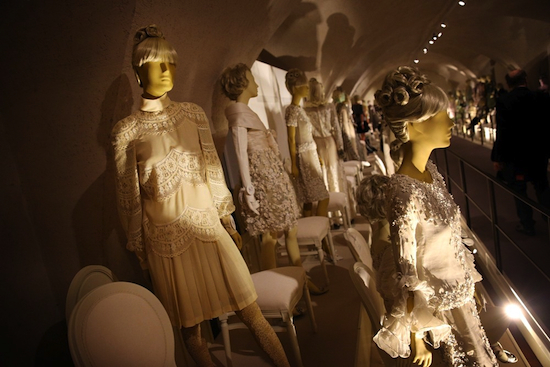 The couture was a sea of monochrome, organza, muted hues, lace, silk georgettes and lavish detailing. All the mannequins were adorned in decorous jewellery, shoes and clutches to complete the look. The collection featured a fantastic variety of dresses, both modern pieces that I know I’ve blogged about before on my Tumblr, and classic designs from the 50’s that radiate class and sophistication. 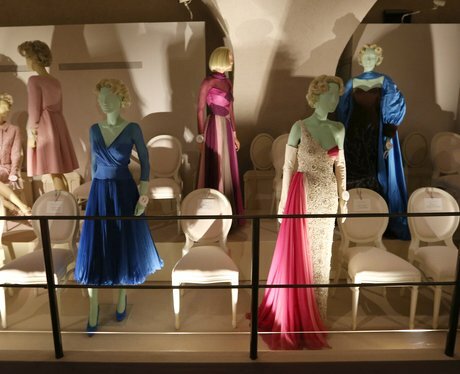 There were also dresses that had previously been worn by starlets Julia Roberts, Sophia Loren, Grace Kelly and Jackie O. My brochure is now covered in notes, sketches and hearts next to my favourite looks. Many of my favourites were the older dresses made up of black and whites, velvet and taffeta. There was also a particular scalloped cream two piece dress that I adore. Even though it was made in the 60’s, I wouldn’t think twice about wearing it now. It was apparent that regardless of the era, each outfit looked truly chic; even the sequins, oversized bows and shoulder pads of the 80’s. All of the dresses along with photographs and sketches are all available from on the Garavani online Museum. Initially opened in 2007, it is the first online museum of its kind. 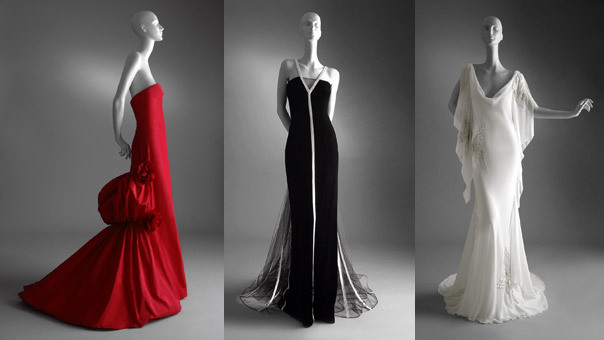 It is definitely worth taking a look at the exquisite gown archives. By the time I had reached the end of the catwalk I felt that warm feeling I have when I see something I love; I felt so refreshed and inspired. I also felt blessed to have witnessed such beloved garments that embody values I try and embrace everyday; class, sophistication and poise. I took one last look at the sparkling beaded back on one gown and headed down the stairs to the second half. 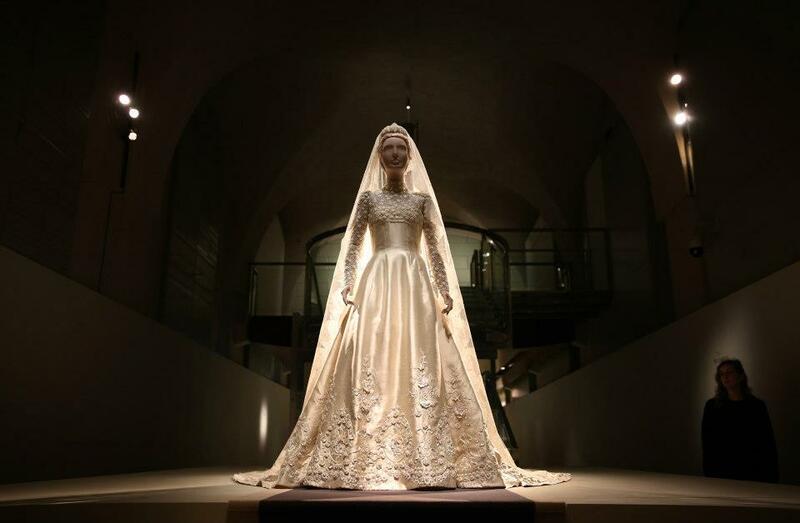 There on the lower ground was the wedding dress of Princess Marie Chantal of Greece. I was mesmerised. It was showcased on its own so nothing drew attention away from the breathtakingly long train. The stunning dress was made up of pearl encrusted ivory silk and twelve types of fine lace that left everyone spellbound. I have never looked at a wedding dress before in such amazement. This, is exactly how I want my wedding dress. Finally, I have found it. 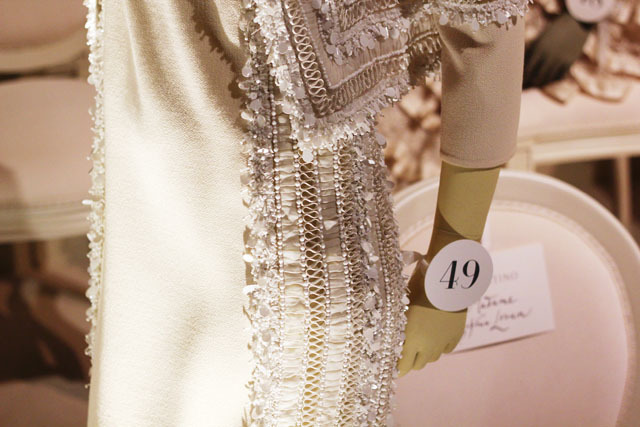 The second part of the exhibition revealed the craftsmanship and techniques that went into each detail and it certainly become clear as to why haute couture is such an intricate craft. The girls, or the le regarre as they are known are the women who stitch every thread, every velvet trim and every pearl onto the dresses. Seeing the complex process each technique entails I am extremely appreciative of there skills. 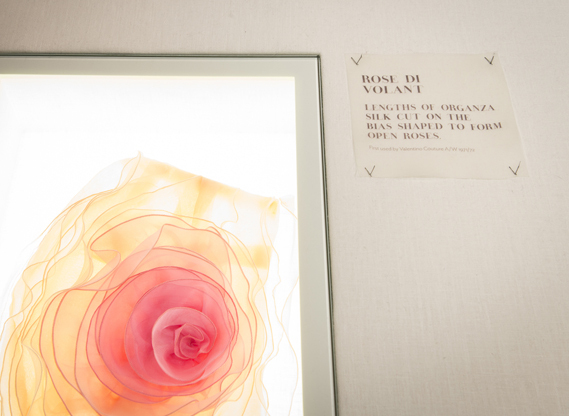 Many of the techniques used in Valentino’s garments were created in the fashion house itself so it was a rare treat to see displays of stitching samples accompanied with short films of the seamstresses at work. In a world where so many things are created for the sole purpose of making profit it was refreshing to see skilful art that’s emphasis is on fine craftsmanship and timeless beauty. 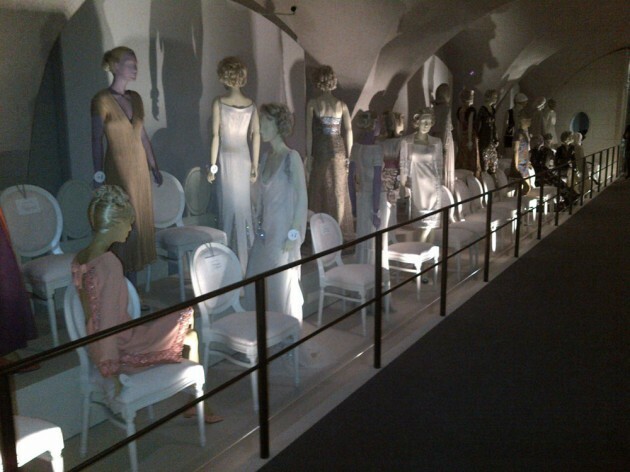 The exhibition was as fabulous as Valentino and every single garment was a delight to get up close and personal with. 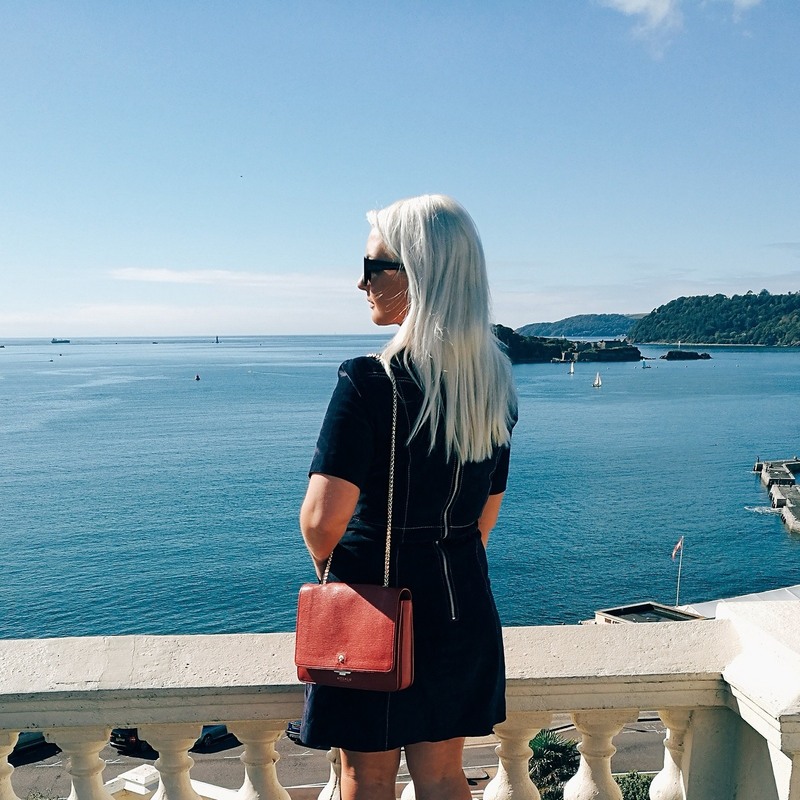 The details exceeded my expectations and each piece exuded chicness. 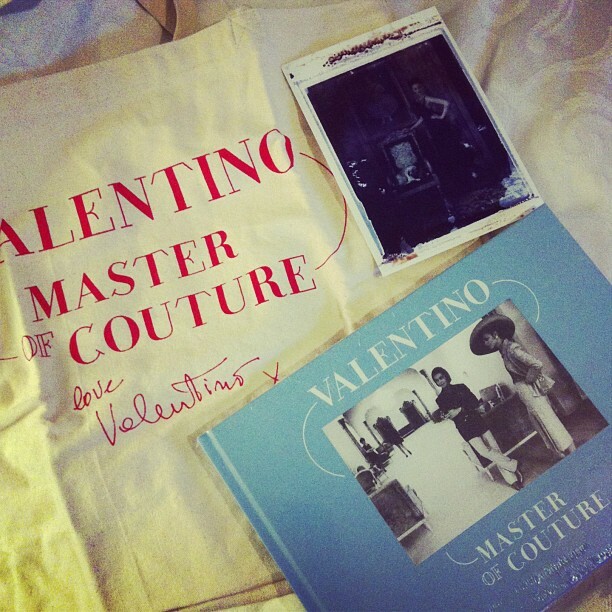 I couldn’t resist treating myself to the Valentino Master of couture photobook published by Rizzoli, a tote bag emblazoned with the same title and a beautifully haunting postcard shot by Cathleen Naundorf. Since Valentino is my greatest fashion love, I couldn’t really say no could I? For more information why not take a look at this stunning short film featuring lots of sneaky peaks of the haute couture. If you are interested in going to the exhibition, it continues until the 3rd of March and tickets can be booked from the Somerset House website.